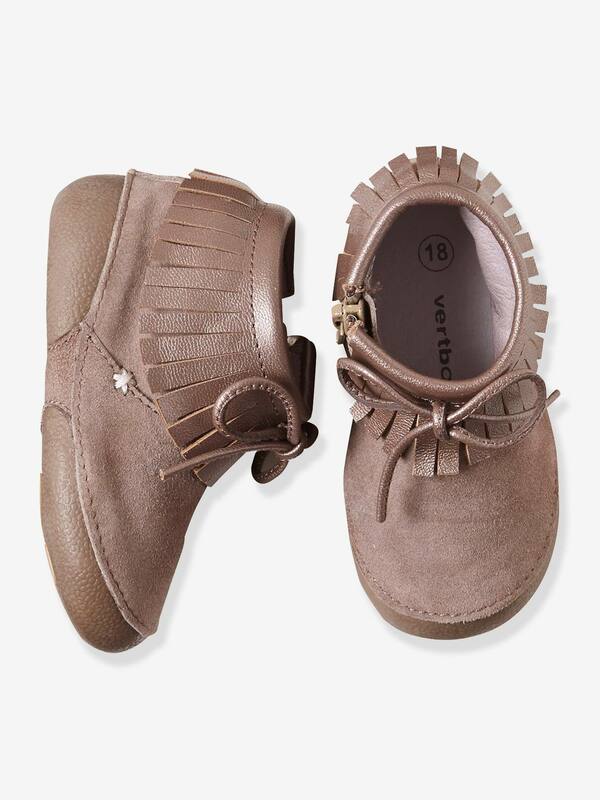 These 4-tab shoes in very soft leather go for Indian styling with the look of a fringed loafer. These are ideal to wear as shoes or slippers and help baby's feet develop as they play and start to move around. Parents love these comfortable baby shoes, designed by Vertbaudet, tested and approved by orthopedic specialist/podiatrist, Mr. Pelligand. Sole: rubber sole, exclusive to Vertbaudet. Exclusive Vertbaudet sole comes in very flexible rubber for freedom of movement. Quick and easy to put on with side zip fastening. Can be worn indoors and out. This shoe is flexible and easy to put on and supports the correct growth of baby's feet and baby's arches. These shoes offer the perfect workout for baby's feet, developing baby's proprioception (sensory and motor development), through developing motor skills, helping them in their movements whilst maintaining a barefoot feel. A fun motif on the underside of the sole to stimulate the sense of touch. We recommend you check your baby's shoe size using a foot scale. Recommended shoe care: wipe these shoes with a damp cloth.